Simple designs are often the most elegant! This Classic Sterling Silver money clip is sure to win the approval of a man who loves to keep it simple, yet sophisticated! 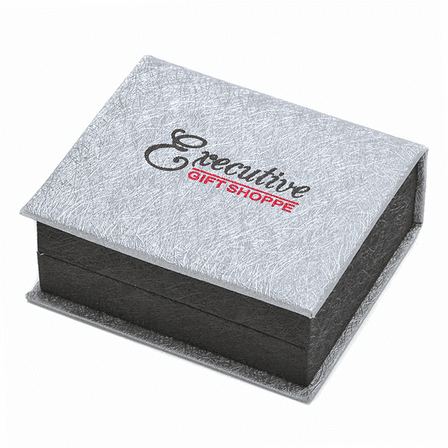 The one-piece French-fold money clip allows for easy removing and adding cash, and securely grips up to 20 folded bills. 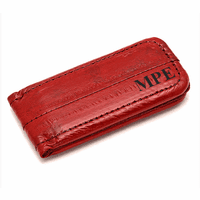 This style lays flat in a pocket, is lightweight, and will make him forget about using his bulky wallet! Add his initials or name with free custom engraving for an extra special touch! What is the font and size of the example? The font is Times New Roman. The font size is XXXL. Is it stiff enough to hold money. Does it bend easy (soft)? Yes, it has a firm grip. Its a french fold which means it is one solid piece of metal, folded onto itself. Can this clip hold credit cards? It can, but it would be a tight hold. This is a french fold money clip and french fold clips have a very tight grip. If you're looking to hold a couple of cards in addition to cash, you may want to choose a spring loaded grip. They have a little more gift to slide a couple of cards in. How many bills will this money clip hold? My husband tends to carry a lot of cash. This money clip will hold fifteen to twenty bills. If you're looking for something to hold more, you may want to go with a hinged grip. They open up and clamp down on bills so they have a little more room to work with. I would need this by Friday at the latest! Wedding present for groom. Is this possible? I'm so sorry for the delay in responding. This money clip is in stock. If you choose 2nd Day Air as your shipping method at checkout, it will arrive on Friday, guaranteed. 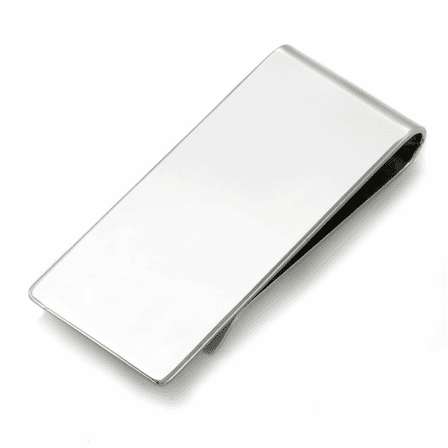 Is the classic sterling silver french fold money clip solid sterling or silver plated? I want to have a business logo on this money clip. Can you do that? Yes, but there is a 5 piece minimum. 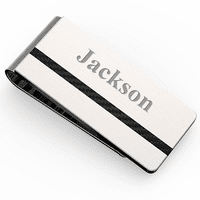 If your logo is engraving ready, however, we can engrave it on just one money clip. Engraving ready format is adobe illustrator black and white .eps. Either way, email us the logo and we'll let you know. Using Times New Roman and size 40 , three letter initials seem very close together in the preview. Would it be better to put a single space between each initial? What do you recommend? No, it looks best without spaces. We'll make sure that the spacing that's actually done look correct. If item is engraved how long before it will ship? It would ship the next business day, even with engraving. Is it 925 sterling silver and what does it weigh? It is .925 sterling silver and it weighs bout .7 ounce. How long do you expect this product to be out of stock? We are expecting this sterling sliver money clip early next week. as soon as it arrives, we will make it available online. And the engraving perfect. My guy really liked it! I'm delighed with my money clip. It is a gift for my husband's 90th birthday. He hasn't seen it yet, but I can't wait for him to show it off at his birthday bash. 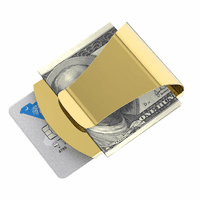 The simplicity of this lovely money clip speaks for itself. Any man would be proud to carry it. Worthy Memento for 50th Birthday! Beautiful memento for my nephew's 50th Birthday; he liked it very much. His initials, and the year commemorating the Anniversary, looked great! ProsGood service. The little box the item came with, also very nice. I would have liked letters bigger- one on example. I ordered one size smaller but still looks great. I probably had engraving too small on lines 2..3. Large on line 1..very nice. A great piece and a great price. I love this piece. It has a heft that lets you know that it will be around as long as I will, and much longer. I went with 3 simple block initials, which gives an elegant, understated and professional look to the piece. A very handsome money clip for a young man. It's a task to wait until his graduation to give it to him. I know he will love it. I bought this money clip for my husband's birthday and he absolutely loves it. The engraving came out great, it shipped fast and it came in a nice gift box. Perfect. The money clips are beautiful and the engraving is perfect. Recieved it in good time and was exactly as I ordered it (the engraving). Very pleased. ProsCame in an excellent/impressive presentation box. And he loved it! !